My neighbor and I volunteered to handle the neighborhood Independence Day parade and picnic this year. One of the items handed out at each parade is a ribbon for the parade participants. In the past these have been purchased from the dollar or party stores at around a dollar a piece. I thought I could surely beat that cost. I made these for pennies a piece. And the best part is mine could be worn by the parade participants and not just looped on to the handle bars of their decorated bikes. Sadly, I was very busy that day and didn't take any pictures after the parade and the ribbons were handed out. This is the only shot I could find with someone wearing a ribbon. 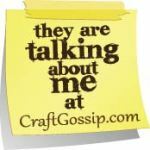 These ribbons were fast and easy to make and I decided they would also be my new method for creating birthday ribbons for my kiddos. In the past I've actually shelled out almost four dollars for one ribbon for their special day. No more. To start I made one for the Great Grandma Gene's birthday and here's the step by step on how you can make one for pennies too. Here's all you need: small piece of felt, pin back, 1.5" wide ribbon (6" per ribbon), 5/8" wide ribbon (24" per ribbon), paper in coordinating colors for ribbon. Do not use wire ribbon. I made this mistake with my first ones. While they look great at first, after being worn the wire begins to move with the person...and stay that way. However, they were easily straightened out at the end of the day. You'll need a design for your ribbon. I created this one from googling bird clipart and then adding the text in Photoshop. My design circle is about 1.8" in diameter. I printed it in brown on blue scrapbook paper to match the ribbon. For my original Fourth of July ribbons I used pre-printed foam circles that were on sale at Hobby Lobby to create my main image. For the second slightly larger accent circle I was originally planning to use scrapbook paper again, like I did for the Fourth ribbons. But instead I opted for an even less expensive option. PAINT CHIPS! They're free and come in a bevy of colors. I tried printing directly on the paint chips for the first circle too but my inkjet did not react well to the papers. Perhaps you can have better luck or if you're artistic you could even draw your own art directly on the paint chips. The second circle should be about 2" in diameter. I really, really wish I had those cool large circle punches to make these. Glue the design to the center of the larger circle. You can do this step now or you can wait until after to make sure your design circle is perfectly straight. Cut one 6" piece of your wide ribbon and four (not the three I have pictured) 6" lengths of your 5/8" ribbon. I buy my ribbon when Hobby Lobby has their 50% off all ribbon sales; which is all but one week a year. Take the wide ribbon and fold it in half lengthwise then cut at an angle from the bottom corner to the center to create the inverted V shape at the bottom. Next with a match or lighter use move the flame close to the V you have cut to seal the edges and prevent fraying. This is only necessary on the V cut to the large ribbon. The ends of the smaller ribbons will be glued down. *note you do not want the flame to actually touch the ribbon, the heat is sufficient. Sorry I don't have a pic of this step. I lack that third arm. Before gluing know this is what we're after. Plug in the glue gun and get ready. Place the circle face down and begin gluing the four strips on with hot glue. I begin with one straight then the next one perpendicular. Continue until all four strips are attached. Once all strips are glued down add a small bit of hot glue and one at a time fold down the ribbon toward the center. Might want to use a pen or pencil to push the ribbon into the hot glue and avoid burns. Continue gluing and folding paying attention that your folding each one in the same approximate distance. Now add a big dollop of glue and attach the wide ribbon. If you already have the main design image attached to the larger front circle be sure to look at the other side and make sure your ribbon is straight to the design. Glue on a small circle of felt. Add pin back. Or you could attach a magnet. Or narrow ribbon if you wan to tie this on to something. Could also glue on a narrow loop of ribbon to allow for hanging. Whatever your purpose. Great Grandma Gene's completed birthday ribbon in her favorite colors with her favorite birds. ...that would be Princess Fierce! She said she didn't know what to give Grandma Gene so she was going to wrap herself up and be the present. She also gave her coupons for unlimited hugs and kisses. Happy Birthday, Great Grandma Gene! 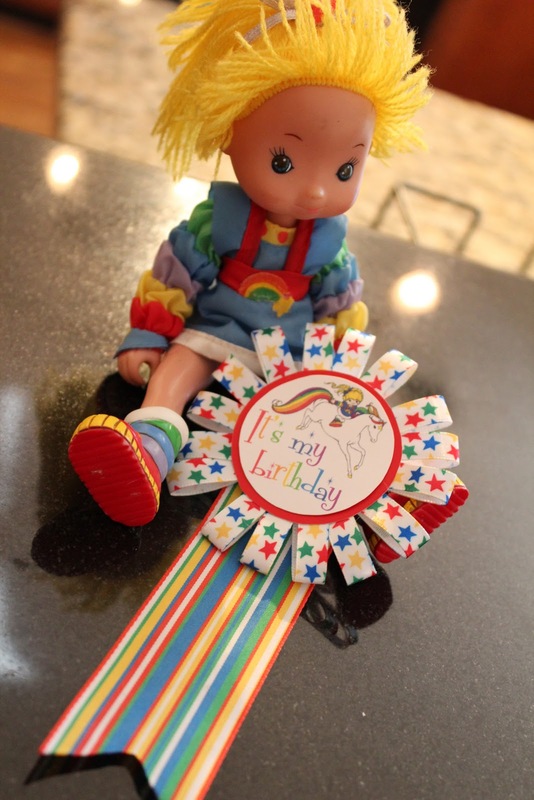 This is the ribbon I made for Princess Fierce's Rainbow Brite themed sixth birthday. The design was made from images off the web and adding my own text. Again the red contrast circle is a free paint chip. For this one I couldn't find the right 5/8" width ribbon so I used 3/8" and just doubled it to eight 6" strips.